This entry was posted in Art Crawl, Uncategorized on August 12, 2015 by admin. From the worst losses archive you might want to check out their site if your a big heritage buff. This entry was posted in Uncategorized and tagged balfour building lister block, Random Hamilton on July 25, 2015 by admin. This entry was posted in Uncategorized and tagged hamilton incline railway on July 22, 2015 by admin. This entry was posted in Uncategorized and tagged hamilton, hamilton farmers market on July 2, 2015 by admin. 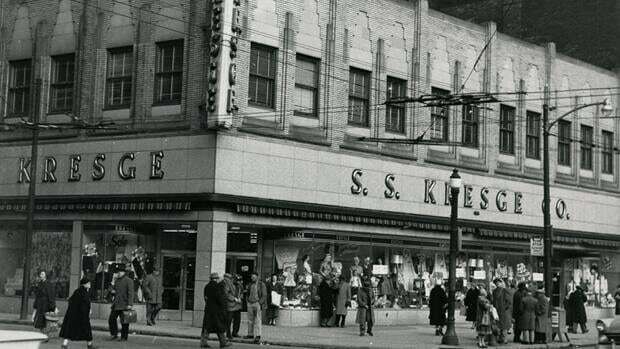 Celebrating one of Hamilton’s most unique and exciting places being around for 3yrs! Featuring artwork by collective artists Aaron Hutchinson, Amy McIntosh, Andrew O’Connor, Ariel Bader-Shamai, Connor Bennett, Emma Waterfield, Kearon Roy Taylor and Petra Matar. The annual tradition of bands playing on the back of Dr.Disc. Enjoy some free music and a great time! Beverley Hawksley is a visual storyteller, but this time, she wants you to bring your own narrative to her images. How you relate to the work, and what you take away from it, is most important to the Huntsville artist. Join us for the opening reception on May 15th and become part of the conversation. There is no There refers to Gertrude Stein’s quote regarding Oakland, CA and its relation to San Francisco, CA: “there is no there, there.” This statement confronts twentieth-century concepts of suburban expansion along with the simultaneous loss of industry. The artists in this exhibition engage with this concept materially and metaphysically through an obscured representation of object based transference; work is created through the removal or covering up of a form; making the invisible, visible, and vice versa. There is no There removes the locative from the aforementioned quote by making cohesive connections between artist methodologies that stretch both regionally and nationally in scope. So we’ve all heard of Hamilton, Ontario but did you know there’s also a Hamilton in New Zealand!? YES, IT IS TRUE. Alex John .K is a punk artist from Hamilton, NZ and is showing his work at Hammer City Records this month! Fans of Raymond Pettibon and classic comic artists Los Bros. Hernandez, Charles Burns and Daniel Clowes will dig his stuff. Come out, eat some hummus, enjoy some sweet tunes spun by HCR resident DJs and feast your eyes on heaps of original drawings and prints that made a very long voyage here. Don’t miss out! Adocumentary about the effects of the Manitoba river damming and the local Cree community. Helena Rakic’s work reflects upon her perpetual affinity for precision. Helena tries to create images that are the honest reflection of her surroundings. Her work often contains the human figure, common objects or vegetation. It is always the subject that is placed in the foreground as she rarely ever integrates a background. It is this very emptiness that is void of distraction that allows for the figure to be the priority. The depleted background automatically creates a sense of isolation and forms an enigmatic presence. Helena see’s her lithographs as simplified metaphors that portray relatable human emotions, which are shown in a surrealist light. Georgina Russell is a textile artist and screen-printer currently living in Hamilton, Ontario. She received her BFA from Emily Carr University of Art and Design in Vancouver, British Columbia. Hunter Gather is a recent foray into decorative textile work. Having worked with garments for several years under the name Hand & Shadow, the materials and process used are similar, however, these prints are not intended to be worn. Instead they are a diary of sorts, a collection and documentation of the natural world. Hunter Gather is an exploration of harvested botanicals, each item collected within the woods near the artist’s studio. A nod to Victorian botanical cyanotypes, decorative floral textiles, and scientific illustration, Hunter Gather is an observation of nature and a tiny selection of what it holds. This month’s exhibition traces a loose parallel storyline, involving both photography and poetry. The photography in this show, was taken on a visit two years ago, in Paris, France and Basel, Switzerland. The poetry is a response to those images written in hindsight. 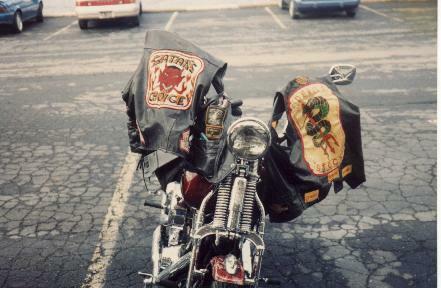 This entry was posted in Uncategorized and tagged Bikers, hamilton, Random Images of Hamilton, Satan's Choice Mc on June 3, 2015 by admin. This entry was posted in Uncategorized and tagged delta bingo, hamilton on June 1, 2015 by admin. via this is colossal website! This entry was posted in Uncategorized and tagged http://www.thisiscolossal.com, Javier De Riba on May 31, 2015 by admin. One last look at this amazing and i do mean amazing art show! TH&B United is a large scale artist project that takes place within the historic industial mill at 270 Sherman Ave. N., Hamilton. Featuring more than a dozen artists and artist collectives, this unique exhibition on the second and third floors of the facility will focus on multidiscipllinary artworks ranging from sculpture to site-specific installations including audio and video. About 20 artists and 1 beekeeper releasing artistic design and honey bees into the Hamilton environment. It is a project with a hive mentality of leaving behind a better or more beautiful landscape. Providing an unique home for Apis Melifera (Honey Bee). The bee in turn provides pollination and fertility in Hamilton. roken Simulacrum explores the impression of control one has when interacting with technology, and how this can frame perceptions of time, freedom, and memory. ANDREW O’CONNOR is a Hamilton, ON based painter, animator, designer and new media artist. O’Connor has a combined B.A. (Hons.) Degree in Fine Arts and Multimedia from McMaster University, and an Ontario College Post-Graduate Certificate (Hons.) in Computer Animation from Sheridan College. A co-founder and curator of Hamilton Audio Visual Node (HAVN), O’Connor is also a recent recipient of the OAC Media Arts-Emerging grant. AMY MCINTOSH is a New Media artist and curator, originally from Embro, Ontario. McIntosh has an Honours Degree in Fine Arts and Multimedia, and an M.A. in New Media and Communications from McMaster University. She is a co-founder of HAVN, a collaborative studio and gallery. Tivoli Condos Bad for James St? Above is a little bit of a design comparison with recent developments in Mississauga. 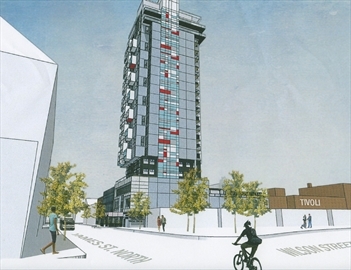 So the Hamilton Spectator has a good article on the proposed Tivoli Condos. The Article touches on a lot of important pieces, from design, functionality,etc. the biggest part of the project I am strongly objecting to is this.. Seriously? You buy a piece of property from Sam the Record Man for $2? (It was part of the family’s last basically donation from their dad. ) I would have preferred that Sam’s kids kept the land, (they probably would have had built the theater back up and pulled a mini Ed Mervish). This whole property was meant to reconstruct the Tivoli! You know increase theatre arts???? Oh not to mention no retail?? No mention of bicycle infrastructure? Like the staff report from city hall, the developers did not consult anyone locally. A shame. 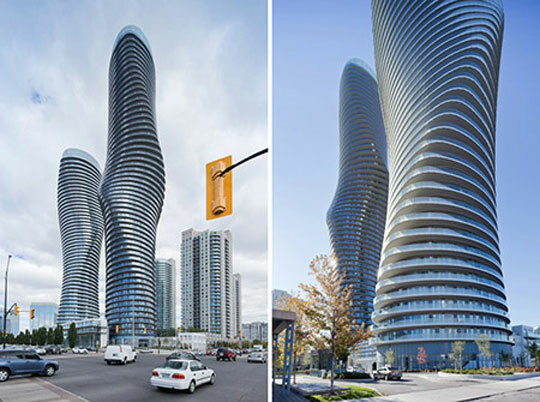 I also think the design is not very inspiring for a “arts district”, even Mississauga has been trying to get some more interesting designs into the mix. Personally I am a huge advocate for density and higher buildings in downtown, I think the people should have asked the building next to them for some air rights? You know like maybe 10 -13 stories but same amount of units? My finaly problem is the fact these are condos, when even Toronto is converting condos into rental units. Most people in Hamilton would love to live on James St. the developer could make long term money and not just a one time thing! Not to mention the need for Handicap accessible living for people who need it the most? Or even subsidized rent for veterans? As a side note I really think city hall has to start to develop a detailed long term plan of what they want or don’t want to see in Hamilton, everything small to big. Because as the cliche goes, the devil is in the details! This entry was posted in Uncategorized and tagged accessible living, development, hamilton housing, hamilton vetrans, hamilton vets, hanicapped housing, tivoli condos, tivoli theatre on March 28, 2015 by admin.